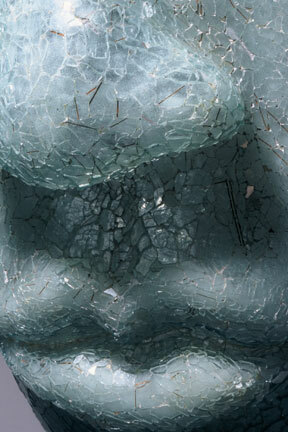 In this piece I have reconstructed broken glass fragments to form a mask. The glass mask presents a dichotomy of concepts, the most apparent being that of camouflage and illumination. The shattered glass of discarded objects references ideas attached to social invisibility. Glass can be invisible until broken in much the same way that people, places and things can be unseen until they are unsightly, cracked or soiled. The properties of glass are transparency and fragility however, once broken, its jaggered edges can be aggressively dangerous.